Pick up at the airport and departure in a southerly direction crossing the High Atlas by the Tizi Ntichka pass (2,260m altitude) where we will make several stops to contemplate some beautiful panoramic views where we can make beautiful photos. We will continue our route by a small road where we will take advantage of to contemplate beautiful landscapes of great chromatic diversity, until we reach the town of Telouat, where we will visit its Kasbah and have lunch in a typical restaurant in the village. In the afternoon we will continue our trip by track passing through several Berber villages where families live in mud houses lost in the mountains until we reach the fortified village of Ait Ben Haddou, where we will visit its famous Kasbah (The Kasbah of Ait Ben Haddou, declared heritage of humanity by UNESCO). In this spectacular frame several famous films have been shot like Gladiator, Obelix, Sahara with Penélope Cruz ... After visiting the Kasbah we will go towards Ouarzazate considered the great desert gate. Dinner and accommodation in Hotel. Breakfast and departure to the Valley of the Roses passing through the Palm Grove of Skoura where a road begins dotted with Kasbahs all different. After several stops, we will arrive at one of the South's strong points: The Todra Gorges. The channel of the Todra River has formed a gorge of vertical walls of enormous proportions and of great beauty. It is a paradise for climbers and a unique place. 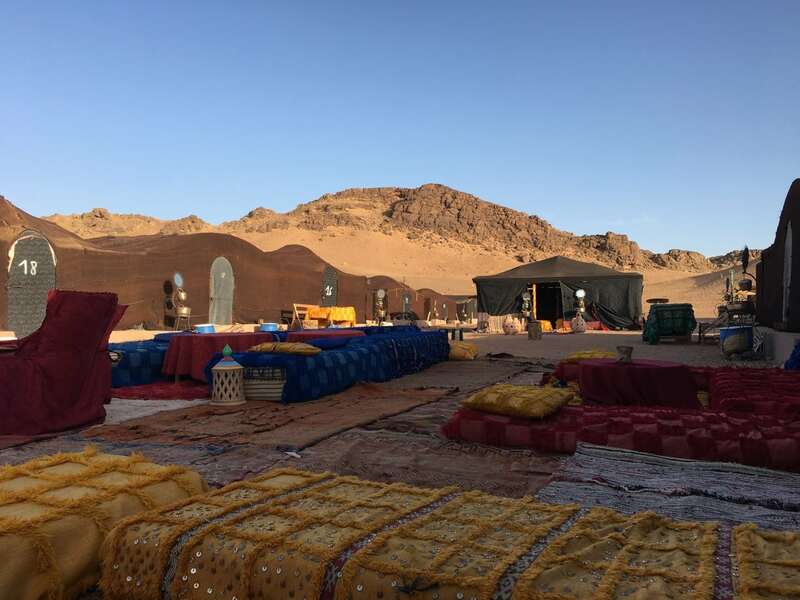 Lunch in a restaurant in the Gorges and continue to the desert until you reach the impressive Dunes of Merzouga. After taking the Hospitality Tea and leaving the suitcases in the rooms, we will have the possibility to climb the dunes and take advantage to contemplate a wonderful sunset. Return from the dunes and talk with the Berbers of the shelter to understand and learn a little more about life in the desert. Dinner and Berber music show with drums and castanets. Accommodation in the hostel. We will wake up before dawn to watch the sunrise from the Great Dune. Return in dromedaries to the lodge. Shower and breakfast. We will leave early for Rissani and visit the city considered the birthplace of the Alaouita dynasty where its market is mainly considered the most important in the south, where many desert nomads go to make their purchases. We will leave the desert behind and cross the arid and at the same time interesting pre-desert landscapes until we reach the Draa Valley where we will make several stops to enjoy the valley next to the river that bears the same name and that is the longest in Morocco and that crosses all the country to Mauritania. We will continue our journey to Zagora, the current administrative center of the area and from where the caravans used to leave for Timbuktu on a long trip that lasted 52 days, from here we can see the entire Draâ Valley and the Oasis that receives the same name, considered the more extensive of Morocco as well as the richest in the production of dates. Dinner and accommodation in Hotel. Breakfast and departure to see the poster that shows the trip of 52 days to Timbuktu (very important Mall of Mali) before going up to the Anti Atlas to get to Ouarzazate where we will visit the Kasbah of Taourirt, Tifoultoute and the Film Studios . We will depart for Marrakech through the port of Tizi N 'Tichka, and we will make a stop to have lunch in a restaurant in the mountains. Later we will visit the Argan oil cooperative where we will discover the process of realization and will explain the innumerable benefits that this product has for the human body. We will continue to Marrakech and in the city we will enjoy a free night to enjoy a walk through the Jamaa el Fna square and dine in the typical stalls that fill the square. Accommodation in Riyadh.